Chasing Blue (Canterwood Crest #2) comes out in a month. One. Month. And if I learned anything from Take the Reins' release, it means that CB could start popping up in stores in 3 weeks or so. Eeek. I'm excited to see them side by side on shelves. That just seems cool. Also, I wanted to give a quick shout out to Tallahassee schools. You all have been so receptive and thanks for asking me to come visit. My March calendar is filling fast and I so appreciate it! Special thanks to Bill Bothwell for coordinating every visit. 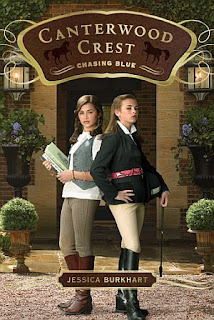 I'm so excited for the release of Chasing Blue. Yay for not long waits! Best of luck at your signing! Thanks, Madison! :) I love the not so long waits, too. So fun. That's so cool that your books are on such a rapid release schedule. Just when one comes out, you're already bracing for the next entry! By the way Jessica, I saw Take the Reins at my local Barnes and Noble the other night. I picked it up and thought to myself, "I know this author!" Haha! Can't wait! I love the cover--so pretty! Wo It seemed like yesterday Take the Reigns was coming out!